The R8 is so very desirable that it ought to figure very highly in our ‘Best of 2016’ list. Really, the only place it loses out is in terms of practicality – it is a supercar after all (despite being quite a comfortable one) – and in the value for money stakes. Well, at Rs. 2.61 crores (ex-showroom), choosing an R8 can only really be an emotional decision. Fortunately, this custom shade of burnt orange makes it very easy to fall head-over-heels for this Teutonic supercar. The naturally aspirated 5.2-litre, mid-mounted V10, which produces in excess of 600 horses, is an absolute marvel of modern engineering – as is the lightning fast dual-clutch gearbox. Such is the versatility of this machine that you can potter around town without any complaint just as easily as you can lunge for the apex of corners at the Buddh International Circuit. 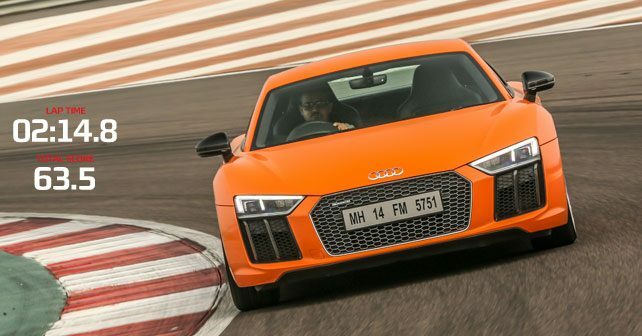 The previous generation R8 V10 Plus was one of the fastest cars that we’ve ever tested at the BIC, so it came as no surprise that the new R8 was staggeringly fast around the track. It was only beaten to top honours, in terms of lap time, by the other machine here that just happens to have the same engine and gearbox sending the same magnitude of grunt to all four wheels – the Lamborghini Huracan LP610-4. You see, the Lambo is just that little bit sharper than its Bavarian cousin. The R8, it seems, is engineered to be easy to drive – which it is, incredibly easy! Right until the point that you approach its limits, at which time it resorts to default understeer to make sure that you don’t get in over your head. And if you try and force it, in an effort to overrule the understeer, it has the tendency to respond with snap oversteer – so it can keep you guessing at the limit. At anything short of the pure limits of adhesion, however, it’s pure joy. The front end is incredibly sharp, the motor is always on the boil, and the gearbox is simply unflappable. Even the ride is quite compliant. Meanwhile, in the cabin, Audi’s virtual cockpit works its magic. The tach is front and centre – and, as you race towards the redline, the far reaches of this simulated analogue gauge glow from yellow to orange to red. It’s safe to say that Audi does digital gauges far better than anyone on the planet. And that’s to say nothing of just how well everything in the cabin is bolted together. The R8, then, is the consummate 21st century supercar – it’s simply engineered to perfection. The only trouble is that it’s missing that vital ingredient that made you overlook the supercars of yesteryear – character. Objectively, though, the R8 is near perfect and you couldn’t ask for much more from an automobile designed to cover ground extremely quickly indeed.